Thank you for joining this year's Anniversary Events! Thank you to everyone who joined the celebrations this past year for the 50th Anniversary of the National Wild and Scenic Rivers Act. On Sunday Oct 14th at The Old Manse and Minute Man National Historical Park in Concord we had an incredible celebration. This event was coordinated by your partners along the River: The National Park Service, the Sudbury Valley Trustees, OARS, The Trustees, and the River Stewardship Council. Reception — Come to the tent at the Old Manse for refreshments, a chance to enter the raffle, a look at the 2018 draft update to the River Conservation Plan, special presentations by partner organizations, and time with colleagues and friends. The family tent will offer some craft activities and an opportunity to become a Junior River Rangers with OARS' educators! Raffle - Stop by the River Stewardship Council for a FREE raffle ticket for great prizes - a CSA share, REI items and 50th anniversary gifts. All you have to do is an some idea for or comment on our Conservation Plan! You must be present at the 3:30 ceremony to win. Chat with our major partners - Sudbury Valley Trustees, OARS, CISMA, Mass Audubon and others - about programs across the region, covering land conservation, water quality, and more. Additional tours: Ranger talks and tours of The Old Manse will also be offered in the area according to their regular schedule. Please see The Old Manse and Minute Man NHP listings. These special one-day only opportunities will all conclude in time for the 3:30 pm reception. Some will finish in time for the 3:00 pm activities. Schedule will be available on-site. You do not need to RSVP for individual activities. Please note that individual activities may change. Please see the event listings on the day-of the event for final details. "Short and Sweet guided anniversary paddle on the Concord River" — Limited seats available by RSVP or on a first-come first-served basis for a guided, instructed paddle under the Old North Bridge. Experience the Wild and Scenic River from the water! 45 min. No experience necessary. All gear (life jackets, paddles) will be available on-site. Join Site Manager Sara Patton Zarrelli and General Manager Guy Hermann for a guided walk in the Old Manse landscape. Learn how different residents used and changed the landscape to provided sustenance, inspiration, and recreation between 1770 and 1850 and how the Old Manse portrays these uses today. Following the walk, we’ll discuss the current landscape restoration project, community involvement, and Trustees philosophy for cultural landscape management. Walk is approximately .5 miles; participants should be comfortable walking on unpaved and uneven surfaces. Our Wild & Scenic river has been of great importance to people living in this area for thousands of years; from a Native American village, the English colonial settlement, and a town in the midst of war and revolution; followed by a revolution of words and thoughts. Co-sponsored by Minute Man National Historical Park. These special one-day only opportunities will all conclude in time for the 3:30 pm reception. Maps and schedule will be available on-site. You do not need to RSVP for individual activities. What IS the state of water quality in the rivers? How has it changed since the time of designation? Why can you fish in it but not eat the fish? Spend some time by the water with OARS staff scientist Sue Flint and experience what a long-term water quality monitoring program means for your community. Bring your questions! Please begin walking down to the ceremony at the Old North Bridge at 3:20 pm. 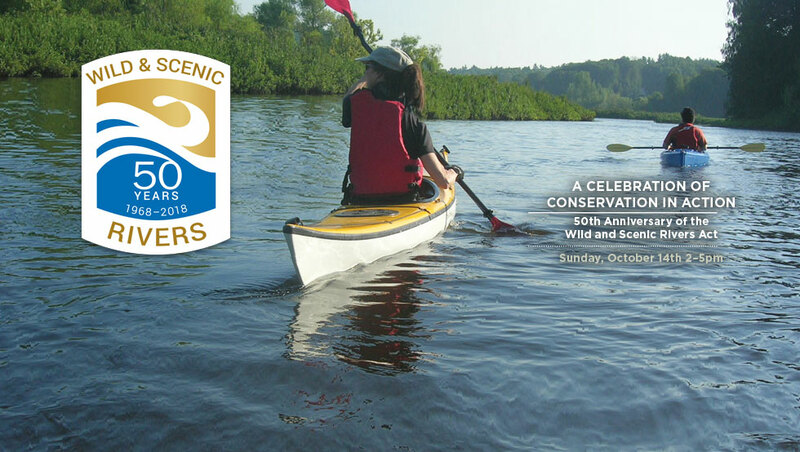 Join representatives from the 8 towns along the Wild and Scenic River, Congresswoman Niki Tsongas and others to celebrate the 50th anniversary of the Wild and Scenic Rivers Act and the 20th anniversary year of the Sudbury, Assabet and Concord Wild and Scenic River!